Oh deer, it seems this game is really short and not much fawn. The Deer happens to be another game generously donated by Mix-Master (seriously, I should just rename this blog "Mix-Master’s Choicest Games") – so thank you again Monsieur Master. I’m not quite sure why I wishlisted this game in the first place, but maybe I liked the artwork and the fact it claims to be an educational game. I’ve loved edutainment titles ever since playing Where in the World is Carmen Sandiego? as a kid and since I actually have a kid nowadays, I was hoping this game could potentially provide her some insight into what the life of a deer was like back in prehistoric times. The game’s controls are very simple. You use the A and D keys to move the deer across the screen and you use the mouse to hover over facts and to click on mini-games. You can then use the mouse to play the mini-games aaaaaand… that’s about it. After five minutes I have explored all there is to explore in this game. So on to the review. The game has some charming graphics thanks to the efforts of Giulia Airoldi. As you explore The Deer you'll come across several interesting facts describing what life was like for deer back in prehistoric times. There aren't that many though and most aren't shown in a meaningful interactive manner. The game is family friendly, as you'd expect for a game aimed at educating children. The game takes five minutes to complete. It says 10 minutes for the amount of time played because I actually tried it again to see if there was anything I missed. As mentioned before, there really isn't much in the way of facts and half of the facts are probably quoted on the game's Steam page already. Yes it mentions the game is for kids but how old? While my three year old found the games entertaining (and could solve them with a bit of help) the mini-game controls aren't too intuitive for her (despite her actually being able to play the game "Memory" using a mouse elsewhere). However, she's still too young to read the facts proficiently or understand them so in that regard, the game is probably aimed at older children. But then you run the risk that the older kids would find the mini-games boring. 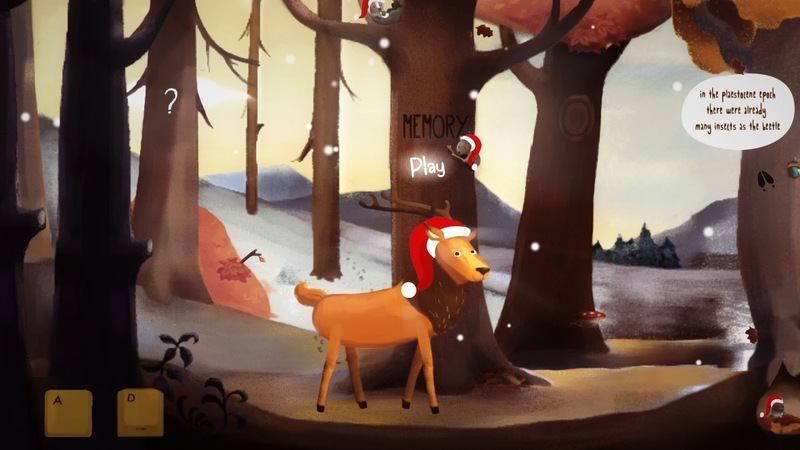 There are three mini-games in The Deer and that's about it: a "Memory" mini-game, a Pick-the-Food-for-the-Deer mini-game and an Assemble-the-Skeleton mini-game. It does deliver on what it promises but I was kind of expecting more – maybe a bit like an interactive version of the kids film "Ice Age" except with interesting facts as the deer traversed across an icy continent. It's not a bad experience, just a very short one that's not terribly fun or memorable. Is the game worth $0.99 USD? : Yes, although only because the developers have managed to deliver their lesson about deer in a mildly entertaining manner. Otherwise, you could just read Wikipedia – for free.